Posted on December 18, 2016, 11:59 AM, by Dream Cast, under Review. Resident Evil is cinematic in the most literal sense. The fixed camera angles from which you view the some-action-but-mostly-puzzle-solving are carefully composed to show only what you need to see, to direct your attention precisely where it needs to go. Those static cameras make what could have easily been a nauseating amount of grunting along walls for hot spots in a conventional first- or third-person game feel as natural and soothing as scanning your mouse cursor over the pre-rendered stills in Myst. In other senses, Resident Evil isn’t cinematic at all. Though it’s only about two hours long (if you play it right), no part of your character’s experience is edited out. The entire game takes place in one single, coherent location, and every second of your traversal through that location is entirely under your control – in fact, it’s kind of the entire point! I’ve heard the gameplay in Resident Evil described as resource management-based, and while that’s true, it also tells you virtually nothing. A dogfight simulator, for example, is all about resource management, pilots balancing thrust and gravity to preserve potential energy while simultaneously spending that energy to maintain an advantageous position or optimal maneuvering speed. So it’s probably a good idea for us to take a minute and nail down exactly what kind of game Resident Evil is. 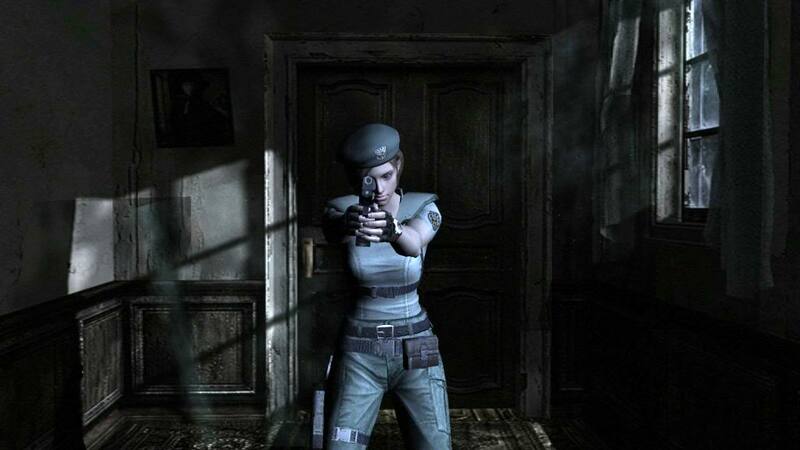 In Resident Evil, you the player are trapped in a spooky old mansion with a variety of ghouls and other monsters. Standing between you and escape is a series of very basic lock and key puzzles. The mansion is segmented into a ridiculously (but not unrealistically) large number of self-contained rooms and hallways, all connected to one another by brief first-person door-opening animations. The player can pass through doors, while the slow, predictable monsters can not (if they could, the whole game would essentially become a very pretty version of Pac-Man (I would like to play that Pac-Man)). The “adventure” part of this action-adventure game involves exploring the mansion to find key items to open previously encountered lock puzzles, then figuring out the most efficient route by which to backtrack through already charted territory without exposing yourself to any more danger than necessary. Actually traversing dangerous rooms is where the “action” component comes in, requiring you to either evade and outmaneuver the monsters, or fight them using a very limited amount of ammunition – either way, failure will deplete your equally precious healing supplies. The traversal puzzles gradually become more complex as more interconnected rooms are unlocked and faster, scarier enemies are introduced. However, it’s not until subsequent playthroughs that the final element of resource management shows up, and that’s when the whole design clicks into place. Resident Evil is a timed game; there’s no hard limit that I’m aware of, but a game clock is displayed on the final score screen (spoiler? ), and the player is assigned a letter grade largely based on it. Surprise! It looked like The 7th Guest, but it was really Crazy Taxi the whole time. Finding faster solutions to the traversal puzzles – and there are ALWAYS faster solutions – becomes the core of replayability, though all the various unlockable alternate game modes certainly spice things up (one of them makes the enemies invisible; by the time you get around to it, you’ll probably already be so well-versed in where they are and how they move that it’s not even particularly challenging). And I haven’t even talked about the most important alternate game mode, the choice of player character at the start, which determines not only how many hit points and inventory spaces and stuff you start with, but also how some puzzles are solved and which NPCs you encounter and basically the entire course of the story line. Resident Evil is one of those games you sit down to write one paragraph about and end up writing eight. Every element of it sounds dangerously sub-optimal on its own (fixed cameras! backtracking! inventory juggling! attrition-based combat! zombies!). It’s only when you fit those parts together like the pieces of an ancient mask that you realize how brilliantly they all complement one another, activating the elevator to the locked off part of your brain that’s still capable of experiencing childish delight at a video game. Resident Evil HD was released in 2015 for PC, PS3, PS4, X360, and XO.